DENVER (AP) — Fair warning: Don’t challenge Nikola Jokic and Gary Harris to a game of Spikeball. The Denver duo are the team’s undisputed champions of a sport that’s a little like volleyball, only players hit the ball off a trampoline-style net that’s set up on the ground. They recently won a team tournament. “It’s the perfect sport for me,” the 6-foot-10 Jokic said. Or basketball. Because he’s pretty good at that, too. The versatile big man averaged 18.5 points, 10.7 rebounds and 6.1 assists last season. His reward from the Nuggets was a max contract worth around $147 million for five seasons. Next on The Joker’s to-do list: Lead the Nuggets back to the postseason for the first time since 2012-13. Denver lost out on the eighth and final playoff spot last season with an overtime loss in Minnesota during their last game. The Nuggets added another veteran presence in Isaiah Thomas , a dynamic point guard who’s trying to re-ignite his career after dealing with hip issues. He’s still on the mend after a hip procedure in March. There’s no timetable for his return. Also back is guard/forward Will Barton , who signed a four-year deal that could earn him more than $50 million. Barton and Jokic figure to be in the starting lineup along with Harris, Paul Millsap — healthy again after tearing a wrist ligament last November that sidelined him for 44 games — and point guard Jamal Murray. The Nuggets open the season on Oct. 17 in Los Angeles against the Clippers. The squad has grown tight through informal workout sessions, such as the one Millsap hosted in Atlanta. They’ve also been working out quite a bit together in Denver. Harris even went to Serbia to visit Jokic over the summer. He saw up close how popular Jokic is in that part of the world. Those two have developed quite a camaraderie, which extended to the Spikeball field. They beat Millsap and Barton in the final. So who’s the better free throw shooter between Murray and assistant coach Mark Price? Over his playing career, Price was a 90.4 percent free-throw shooter. Murray currently checks in at 89.8 percent over his first two years in the league. Murray gained about 15 pounds of muscle in the offseason to be able to absorb more hits when he’s barreling down the lane. Jokic also got stronger. 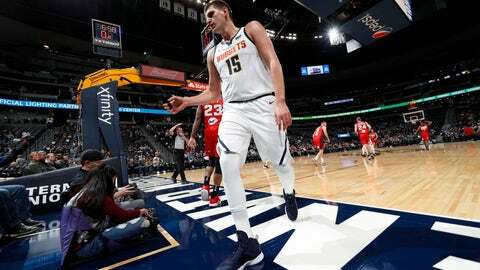 “You don’t see it?” Jokic cracked of his muscle gain. The Nuggets are stressing defense after allowing 108.5 points per game in ’17-18. Then again, Malone always preaches defense. When Millsap came back from his wrist injury, he had a conversation with Jokic. The extent of the message: This was Jokic’s team to lead. Rookie forward Michael Porter Jr. underwent a second back procedure in July and there’s no timetable for his return. Porter was taken by Denver with the 14th overall pick in the June draft. He was considered a top-five selection before a back injury that required surgery limited him to three games at Missouri in ’17-18. “Getting better week by week,” Porter said.